Flexiblity to constantly upgrading or downgrading infrastructure based on project requirements, optimizing infrastructure to organizational requirements, flexibility to change requirements on-the-go, maximized service and a wider range of choices. We have been in business since 2000 and we seek to become the reliable partner that you call on whenever a technical need or crisis arises. We’ll foster an exceptional working relationship with you. Our client base includes mid-size and larger companies. Upfront savings—For startup businesses, cash is everything. That’s why it’s so important to save money now while cash is tight. By renting computers, your upfront costs are much lower than if you were to buy them. When you buy, each computer can cost hundreds, even thousands of dollars. When you rent, you only pay a fraction of that cost in the beginning. Use the most current models—The technology with computers is always moving forward. As soon as you walk out of the store with yours, it’s pretty much outdated. The good thing about renting is that you can always swap your computers out for the latest models. This ensures your company is always on the cutting edge, using the latest available technology. Test different computers—Renting is a good way to test drive various models of computers. Maybe you’re debating whether your office should use PCs or Macs. Instead of spending thousands of dollars without being sure which better meets your needs, you can spend a little time renting each type of computer. Then, once you find the model you prefer, you can consider buying them. 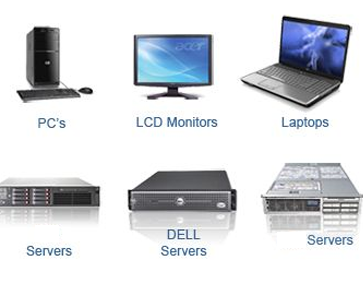 Add or remove computers easily—Whenever you buy computers, you’re stuck with them should an employee quit or you need to downsize. Or, if you need to hire new employees, you have to buy more computers. With renting, you have the flexibility to add or remove computers quickly, easily, and affordably.